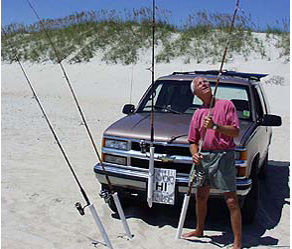 TheFishingLicense.com - The innovative new fishing rod carrier for your vehicle. ... The Rod Carrier That Enhances the Beauty of Your Truck! Whether you're pulling the boat to the lake for Largemouth Bass or fishing the surf at the ocean's edge for Big Drum and Speckled Trout, our innovative new FishingLicense is simple, convenient, attractive and affordable. It folds away when not in use and also prominently displays the license tag of your choice. Each FishingLicense is crafted from maintenance-free, non-corrosive materials. Attractive || Easy Installation || Aluminum/Brass/Stainless Steel || A Great Gift For Any Fisherman! The FishingLicense utilizes 4 standard "sand spike" rod holder inserts. If you don't already have sand spikes, they are readily available in tackle shops, or you can easily make your own from standard 1.5" PVC pipe. Optionally, you can purchase them from us below. 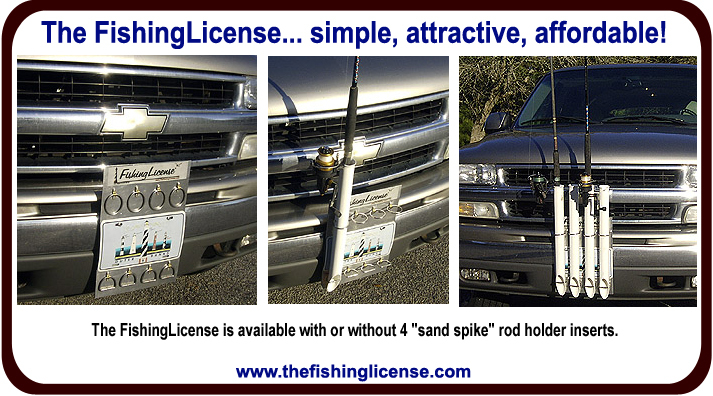 The FishingLicense is available with or without 4 "sand spike" rod holder inserts. You can make your own "sand spikes" from 1.5" PVC pipe (22" long, sharp 70 degree angle bottom) or you can purchase them from a tackle shop or you can add them to your FishingLicense order with us. Copyright 2016 Hatteras Designs, Inc. All Rights Reserved.